This was a highly atypical month because I spent the vast majority of it traveling. In addition to the listed items, I also bought three pieces of fairly cheap summer clothing from street vendors in Korea and a very large quantity of Korean beauty products, but those came out of my separate travel budget. My general rule for categorizing purchases was that brands or items that I would have purchased in the normal course of my day-to-day life in the US would fall under my regular shopping budget. The other clothes I bought were primarily for wearing during the trip because the humidity and heat made some of my packed clothes less appealing. In terms of my travel spending, I set aside a fairly generous budget for this trip, but with the vague expectation that I likely wouldn't spend it all. I ended up buying more than expected in Korea, some of it to serve as gifts, which has brought me a lot closer to using up my entire trip budget. Ann Taylor Lace Dress - $83.40 - I bought this dress just before I left the US, during a 40% off regular price promotion, which resulted in a price that was decent, but a bit higher than I typically spend on an Ann Taylor dress. H&M Paisley Shorts - $12.65 - I bought this pair of shorts on sale as an impulse buy in Taipei. H&M items are generally marked up a fair bit in Taiwan, but the sale price on these proved to be about as good as the same item's sale price in the US. Although these shorts are 100% polyester, they are loose-fitting enough that they're generally comfortable in the summer weather here. Black Ballet Flats - $16.15 - Similar pair pictured. The only shoes I packed for my trip were the Keds I bought a few months ago and my Fitflop sandals, and I had a few fancier outings planned that required more formal shoes. I picked up ballet flats from a vendor in the underground mall at Myeongdong subway station. I'm not sure whether these are leather, though at the price (19,000 KRW) I don't really expect them to be. The quality on these is otherwise better than I would expect from similarly priced pair at Urban Outfitters or Forever 21, though they were more difficult to break in than the flats I typically buy. 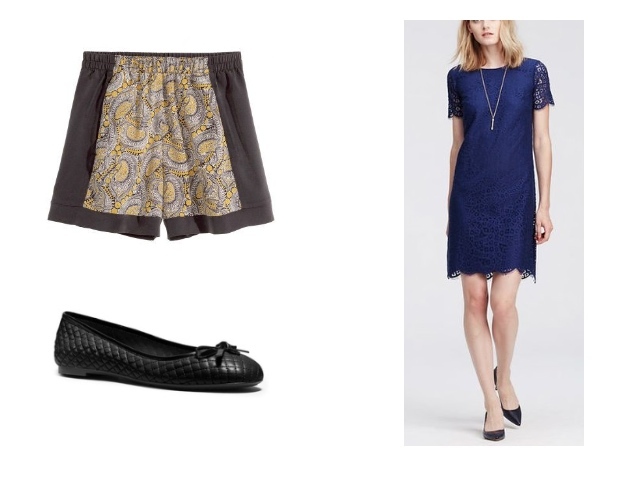 While I don't typically believe in spending a lot on ballet flats because they have an extremely short lifespan with me, I would normally like to spend a bit more to get more comfortable ones. I'll continue to wear these when I get back home. Linking up to Franish and the Budgeting Bloggers this month. Be sure to check out what everyone else bought this month! Korean ATMs, The Great Firewall, etc.